The regular Crosstrek can still claim superiority over the hybrid in two areas, however: cargo space and towing. The Hybrid’s towing capacity is just 1,000 pounds—500 less than the non-hybrid’s 1,500-pound limit—and cargo room is down from 20.8 cubic feet behind the rear seats to 15.9 cubic feet. Cargo space with the rear seats folded down is 43.1 cubic feet, less than the 55.3 found in the regular model. The reduced cargo space is a result of the battery pack mounted below the cargo area. You barely feel the Crosstrek Hybrid’s extra weight around town because it’s much quicker off the line than the non-hybrid model. Thanks to the instant torque from the electric motor, you don’t have to wait for the loud gasoline engine to rev to power. The electric motor produces 149 lb-ft of torque alone, 4 more than the 2.0-liter flat-four produces at 4,000 rpm in the regular Crosstrek. If more than half throttle is applied or if the battery is low, the Atkinson-cycle flat-four will kick on for additional thrust. Occasionally, the engine turning on sends a small jolt through the driveline. At highway speeds, the 148-hp hybrid system (4 hp less than the regular Crosstrek) did struggle to get the 3,732-pound crossover to speed during some passing and merging maneuvers on L.A. ‘s busy highways. Subaru did its best to make the Crosstrek Hybrid drive as normal as possible. Like a regular gasoline vehicle, the Hybrid creeps forward from a stop in any drive mode, and the shifter looks and operates just like a regular one with the exception of the B position that increases engine braking for downhill stretches. When lifting off the gas pedal, hybrids and plug-ins regenerate power through braking, and this can feel unnatural to drivers not familiar with it. This isn’t an issue in the Crosstrek because regenerative braking is almost unnoticeable. However, individuals new to plug-ins might find the sound of the electric motors to be strange at first, especially when coupled with the pedestrian warning sound (activates in EV mode below 20 mph). During my time with the plug-in, I did drive the claimed 17 miles on all-electric energy but only with a light foot. Driving like I normally do (somewhat quick) shrank the range to 12-15 miles. Sport mode (instead of the normal Intelligent mode) significantly increases throttle response but also hurts the EV range. When the battery is low, the Crosstrek acts like a regular hybrid and delivers a Subaru-claimed 35 mpg combined. In the two weeks I had the Hybrid, I achieved 42 mpg overall (including EV travel time). But if I had the ability to charge at home every night, I would rarely use the gas motor because my workday round-trip commute is 8 miles, well within the EV range. For some perspective, the much larger Mitsubishi Outlander PHEV has a 22-mile EV range and is rated at 25 mpg combined. But its smaller gas tank gives it a total driving range of 310 miles versus the Crosstrek’s 480 miles (based on 45 percent highway and 55 percent city driving). If owners want to save or charge their battery pack for future use, Subaru offers Save and Charge modes. The former uses the gasoline engine more often in order to save the battery for later use. Charge mode uses the flat-four to charge the battery pack in case you don’t have access to a charger and want to use EV power later. However, this is the least fuel-efficient mode. What will my wallet think? Subaru offers the 2019 Crosstrek Hybrid in one loaded trim that starts at $35,970 before EV rebates. Opting for the one available package will cost another $2,500 for a moonroof, upgraded sound system, heated steering wheel, and integrated navigation, bringing the pre-rebate total to $38,470. That might sound like a hefty amount, but those who qualify for federal tax credits and state rebates can significantly reduce the vehicle’s overall cost while saving money at the pump. Additionally, the Crosstrek Hybrid will be sold in every state (but in some places, expect a wait time after it’s ordered). 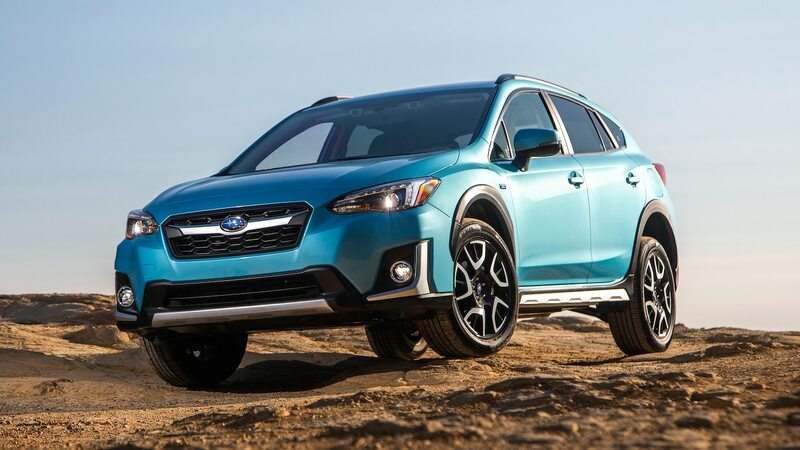 The 2019 Subaru Crosstrek Hybrid is a solid choice for someone considering their first plug-in or for folks who want to save money at the pump while experiencing daily driving and off-roading on all-electric power. The Subaru might not be the most efficient or have the longest EV range among plug-in hybrids, but it’s a rare bird in a plug-in crossover market filled with mostly expensive options.